Wild turkeys are instantly recognizable birds that are more common in yards than many birders realize. With the right preparation and steps to attract these large game birds, they can be regular visitors to your yard as well. Wild turkeys are fascinating to watch, not only for their distinctive plumage but also for their interesting behavior and social natures. They eat many insects and a flock of turkeys can be ideal pest control for a yard, but before attracting turkeys, it is important to consider the problems they may cause as well. Empty Feeders: Turkeys are very large and because a single flock may have a dozen or more adult birds, they can quickly clean out a large feeding area. This deprives other birds of a safe, reliable feeding area, and it can be expensive for a birder to feed wild turkeys without appropriate precautions to safeguard certain feeders. 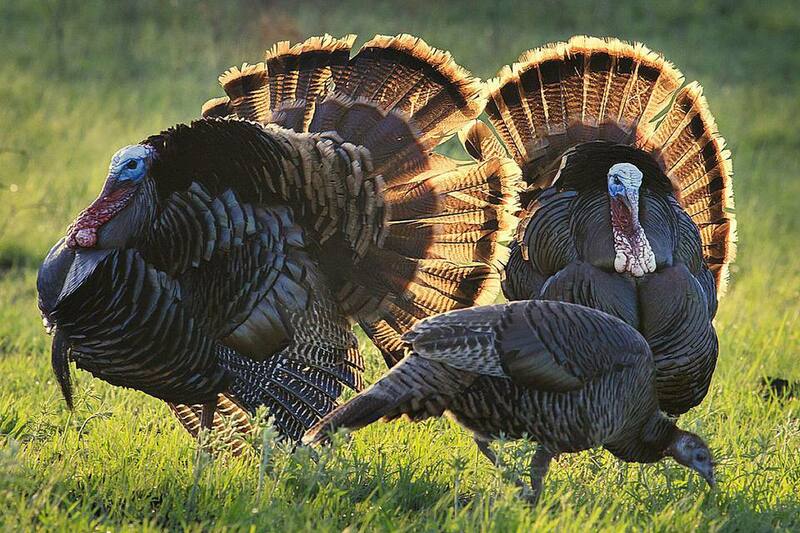 Damage and Messes: Turkeys are quite strong and can easily damage small feeders. As they explore a yard or garden, they can also damage young plants, garden produce, patio furniture, or decorative items. Feces, shed feathers, and scratched areas can also create large, unsightly messes, not only in a birder's yard but in adjacent yards where neighbors may not appreciate visits from wild turkeys. Injuries: These birds can be aggressive, particularly during the breeding season when males are competing for mates and females are protective of their young poults. If agitated, threatened, or cornered, a wild turkey may attack other large birds, pets, children, or adults with a sharp bill, beating wings, and strong talons. Vehicle Accidents: As turkeys get accustomed to visiting a yard, they may begin to roam through other parts of the neighborhood that they perceive as their territory. This puts the birds at risk of vehicle collisions and other dangerous situations, or a flock of turkeys alongside the road could impede traffic and cause other problems. Law Violations: While it isn't necessarily illegal to attract new backyard birds, wild turkeys may be an exception in some areas and it could be against the law or homeowner association restrictions to deliberately feed these birds. Particularly where overpopulation of turkeys is a concern and hunting is permitted, having turkeys in the yard can cause complications with hunting regulations. Despite the potential difficulties with attracting backyard turkeys, it can still be an enjoyable and entertaining experience if it is suitable for your property. To make your yard more turkey-friendly, it is essential to meet these game birds' survival needs. Food: Turkeys are omnivorous and will sample a wide variety of foods. Birders can provide a large ground feeding station with cracked corn or mixed birdseed, or turkeys will happily clean up under hanging feeders. Plenty of natural foods are also great for turkeys, including nuts, berries, crabapples, snails, slugs, and insects, and letting turkeys snack on these natural foods is a cheaper alternative than paying for their hearty appetites. Water: Ground bird baths are best to provide turkeys with water, and the basin should not only be low, but should be sufficiently broad to accommodate a large turkey flock. A shallow bath will be more attractive to turkeys, and it should be kept as clean and fresh as possible. Turkeys will also drink from broad puddles or similar water sources. Shelter: Turkeys roost overnight in large, mature trees, and planting deciduous trees in a thick patch or leaving a woodland border intact adjacent to the yard will help provide that shelter. Tall scrub brush, mature shrubbery, and a large brush pile or wood pile can also help provide shelter that will attract wild turkeys. Nesting Sites: These birds nest on the ground beneath shrubs or a brush pile, and if that shelter is already in the yard, turkeys may choose to raise their young nearby. They have large broods, so a good-sized private area for nesting is essential. Leaf litter is the best nesting material for a turkey's shallow scrape, and they will use other plant debris to line the nest. Even if your yard is turkey-friendly and you know wild turkeys are found nearby, they may not yet be visiting your yard. In that case, few extra steps may be necessary to entice these birds to make an appearance. Create a large, wide dust bath for turkeys to dust and preen safely and conveniently. Minimize insecticides or herbicides that would eliminate natural turkey foods. Allow landscaping to overgrow somewhat to be more secure shelter for these large birds. Provide a low stump or boulder for a guard perch so turkeys can watch for threats. Keep pets indoors or closely supervised so they do not spook or harass turkeys. Be prepared to host turkeys year-round, since they stay in the same range every season. It can take some time to attract a loyal flock of wild turkeys to visit the yard. If after careful consideration of the potential problems they may cause you still want them to visit, patience and careful planning to meet their needs can make your yard a sanctuary for wild turkeys.